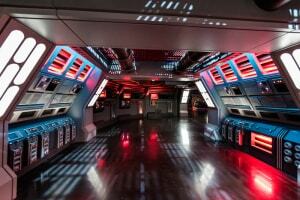 Ever wanted to step into the scene from “A New Hope” where Luke and Obi Wan meet Han in the cantina on Tatooine? 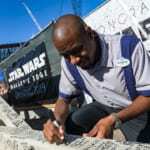 Well now you’ll have your chance at something similar with Oga’s Cantina coming to Star Wars Galaxy’s Edge in both Disneyland and Hollywood Studios in Walt Disney World. 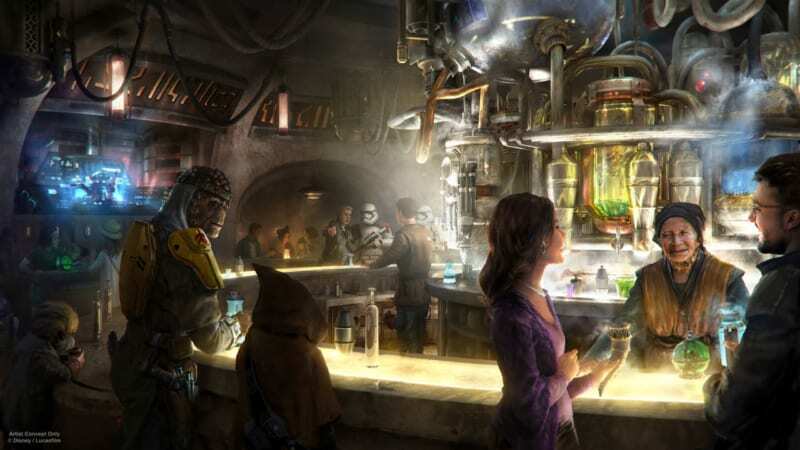 Disney released some new information on one of the two restaurants coming to Galaxy’s Edge including the fact it will serve alcohol, and the cantina’s long history and backstory. Oga’s Cantina is the perfect dining location on a remote outpost like Galaxy’s Edge and will serve pilots, bounty hunters, smugglers, locals and galactic travelers alike. 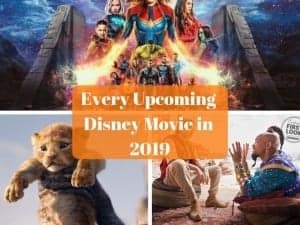 Disney says you might even “encounter a friend…or a foe” which makes me think that we will be visited by random characters from the Star Wars universe from time-to-time. Imagine you are enjoying a meal and all of a sudden a bounty hunter starts a fight in the cantina, creates chaos and gets hauled off to jail. 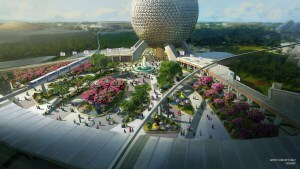 Disney has a big opportunity to make this a great entertainment venue as well as dining. Disney also confirmed that Oga’s Cantina will be the first public dining venue in Disneyland that serves alcohol (Club 33 does but it’s private). They said: “Patrons of the cantina come from across the galaxy to sample the famous concoctions created with exotic ingredients using “otherworldly” methods, served in unique vessels. With choices for kids and libations for adults, the cantina will make for a great stop!” Libations for adults sure sounds like alcohol to me and you can see the bar in the concept art above. I don’t think that alcohol served in one restaurant in Disneyland is going to be the end of the world, and I assume it will also be served in the other restaurant in Galaxy’s Edge. We also got details on some more of the entertainment coming to Oga’s Cantina, RX-24, the former StarSpeeder 3000 pilot droid from Star Tours is now serving as the cantina’s DJ which aught to be a blast! Oga’s Cantina is only one of the two restaurants coming to Star Wars Galaxy’s Edge, which will be the quick service location. There’s a Table Service restaurant that we are still awaiting details on, but it too will be full of entertainment including some kind of show. 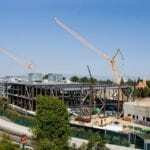 Both will open with Star Wars Galaxy’s Edge in 2019. Stay tuned for more details on Oga’s Cantina and all the other Star Wars Galaxy’s Edge news right here! Are you excited for Oga’s Cantina? Are you ok with it serving alcohol in Disneyland?